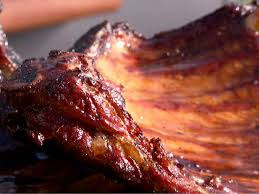 First prepare the grill for indirect heat using hickory and charcoal and heat to 250 degrees F.
And then place the ribs on a clean cutting board and pull off the membrane, the thin fatty skin that lines the underside of the ribs. Trim the ribs of excess fat and meat. Then for the rub: Whisk together 2 tablespoons salt, brown sugar, paprika, chili powder, cumin and pepper. Rub the beef ribs with the seasoning and place on a sheet tray, cover with plastic wrap, and if time, let marinate in the refrigerator for 8 hours or overnight. Add the maple syrup, apple juice, brown sugar, vinegar, mustard, chili powder, cayenne, salt and pepper to a medium saucepan and bring to a simmer. Cook until syrupy, about 8 minutes, stirring with a wooden spoon on occasion. And then remove the ribs from the refrigerator. Place the ribs meatier-side-down on the grill away from the coals. Cook the beef 3 hours, adding more coals as needed. Turn and cook until the ribs "bend" and the meat easily separates from the bone using a fork, about 45 minutes more. 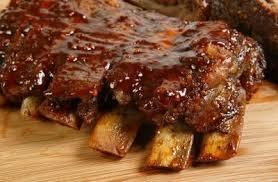 Brush on the glaze to the ribs and cook for another 5 minutes. Remove and slice into individual ribs. Serve this dish any decorated plate or bowl. Its delicious and yummy.